Some people see disability as a burden, and the statistics can make it hard to see it as anything less. Having a disability places you in the world’s largest minority group as 10% of our current population, or roughly 650 million people, live with a disability. Worldwide, less than 50% of children with a disability will finish their primary education, preventing them from ever reaching their full potential or allowing them to become independent members of their communities. But others see disability as a gift. Diagnosed with cerebral palsy at 11 months old, Michaela “Chaeli” Mycroft has been a wheelchair user her whole life. 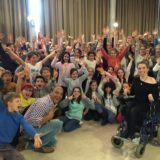 She made the decision to use her disability as a way to leave a positive footprint on this world as an “ability activist” by co-founding The Chaeli Campaign in 2004 when she was nine years old. The Chaeli Campaign supports the mobility and educational needs of disabled children in South Africa to make a significant and lasting difference in a disabled child’s life. Just like any able-bodied child, Chaeli believes children with disabilities should be given the opportunity to live a full life and reach their potential. Focusing on ability, Chaeli has challenged herself to conquer some of the world’s toughest adventures to encourage other disabled children and their families to focus on the possible—not the impossible. In 2015, she became the first female quadriplegic to summit Mount Kilimanjaro, celebrating her 21st birthday on “Kili.” In 2016, she ran the Comrades Marathon, an 89-kilometer race that originally discriminated against participation of wheelchair users. They altered their rules as a result of Chaeli’s activism and persistence, and she has run the marathon every year since. In 2018, she started an initiative called “Bet Chaeli Can’t” where she swapped out her wheelchair for a horse and rode for five consecutive days. She endured five hours in the saddle each day, the natural elements around her and the voices inside her telling her to quit in order to raise funds for children with disabilities … and to prove those who betted against her wrong. Each year, The Chaeli Campaign helps more than 9,000 beneficiaries: children with disabilities and their non-disabled peers and family. They are based in Cape Town, South Africa, but their impact is national and has spread across continents. In 2017, they expanded their work to the United States, and in late-2018, The Chaeli Foundation became an official US-based charity organization. 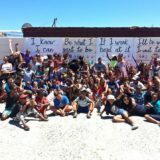 Since Chaeli was originally honored by World of Children in 2012, The Chaeli Campaign has maintained its same ethos of inclusion, but their programs have grown immensely. The Chaeli Campaign serves as an administrative and business hub to various independent projects. The Lucy G Craft Café is an independent social enterprise providing disabled young adults with vocational training and work opportunities, made possible training they originally received through The Chaeli Campaign vocation and rehab program. The Bhabhisana Baby Project provides therapeutic services to at-risk and disadvantaged children during the first three years of their lives and has now been registered as an independent nonprofit after a three-year partnership. One of their largest and most impactful new programs is the Pay-It-Forward Ambassadors Program, a youth empowerment project that provides leadership and entrepreneurial skills to mold young social leaders. Children as young as 12 years old are encouraged to develop their own community program or outreach campaign to raise awareness or fundraise for a cause they feel passionate about, even if their passion isn’t children with disabilities. Chaeli encourages teens and young adults from all walks of life and backgrounds, with a range of abilities and disabilities, to be who they are and to follow their own passions and dreams. She currently facilitates two Ambassador groups in Cape Town and has programs around the country that are supporting 250 children from 70 different schools. Today, Chaeli is a typical millennial. She graduated from Cape Town University as the first disabled student with a personal assistant to live in campus accommodations. She recently submitted her thesis to complete her master’s degree and has plans to start her PhD later this year. Her passion as an ability activist has won her internationally accolades including the International Children’s Peace Prize in 2011 and the first-ever medal for social activism by the Nobel Peace Laureates in 2012. In 2018, she was a member of the first class of Obama Foundation Leaders: Africa, a highly selective program for up-and-coming young leaders and was also selected as a 2018 Global Changemaker.